Annually the men of Alpha Phi Alpha Fraternity, Inc. – Nu Pi Lambda Chapter host their Black and Gold Scholarship Ball to raise thousands of dollars towards the education of deserving students in need. The hope is to encourage their higher learning aspirations. This fundraiser stands as the Arlington Alphas’ premier signature event. The Alpha Ambassador Club (AAC) is a young male mentoring program that teaches Leadership, Critical Thinking, Decision Making, Technical Skills (like the Microsoft suite), Legal skills (resulting in a Mock Trail) among many other skill-sets. This program also promotes brotherhood among the young men and provide opportunities for them to serve in the community (and go on college tours). College SCHOLARSHIPS are awarded to seniors based on participation. We will have an information session on Saturday, August 25, 2018, at 10 AM. It will be held at Tarrant County College on 2100 Southeast Parkway, Arlington, Texas 76018. Annually the men of Alpha Phi Alpha Fraternity, Inc. – Nu Pi Lambda Chapter celebrate with their Black and Gold Scholarship Ball. This event raises thousands of dollars towards the education of deserving students in need. The hope is to encourage their higher learning aspirations. 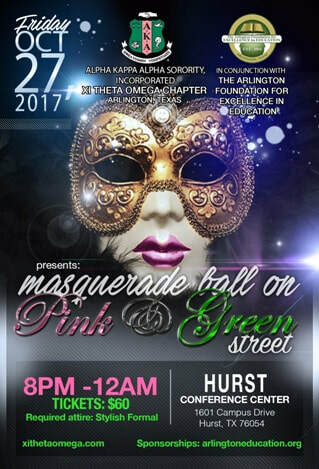 This fundraiser stands as the Arlington Alphas’ premier signature event. The 4th Annual Golf Fundraiser. Raising scholarship funds for the young men of the Alpha Ambassadors Club (our young male mentoring program). Golf Carts, Hot Lunch, Goodie Bags, Caddies, and Trophies\Souvenirs will be available. Many Special Players,So many Special Guests, Many Sponsors, and always great fun. Are you playing with a team or playing solo? if you have a team of 4, put them down. if you are doing this solo, put only your name down. Day of Action is A Chapter Initiative for those in South West Region to engage with the community and Serve. Nu Pi Lambda's Spring Information. Come and Enjoy the annual Christmas social with the Nu Pi Lambda Chapter brothers of Alpha Phi Alpha Fraternity. Bring a wrapped book for an elementary aged student. Books will be donated to elementary school aged kids in the area. Nu Pi Lambda's Chapter Meeting is every Third Thursday of every month. Assisting along with the sisters of Xi Theta Omega chapter at the Annual Fall Festival event held at Mount Olive Baptist on Saturday November 5th, 2016 from 10am-3-pm. Please confirm with Brother Bryon Temple at catermedic@msn.com or Bro. Maurice Washington at 214-392-9563 if you can assist. Please see the attached Flyer for the chapter mixer with Xi Theta Omega/ AKA chapter of Arlington on Wednesday, November 2, 2016. We are encouraging brothers to come out and show strong support for this event. Relationship building!